With the completion of the Umeda Kita Yard Redevelopment Project in 2011, the robot takeover of central Osaka will have begun. This 7-hectare area on the north side of JR Osaka station will be home to the Osaka IRT Research Center (tentative name), which will bring together ten companies -- including Citizen, German industrial robot manufacturer KUKA, Panasonic (Matsushita), Murata Manufacturing and others -- who will conduct IRT (information/robot technology) research in areas ranging from data communication networks to artificial intelligence to control technology. 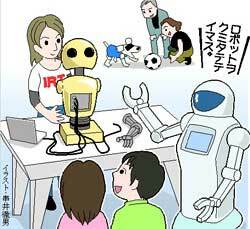 In an area open to the human public, the companies will maintain ongoing interactive exhibits showcasing the latest advances in robotics, making it an ideal destination for tourists and residents who wish to acquaint themselves with their new overlords. 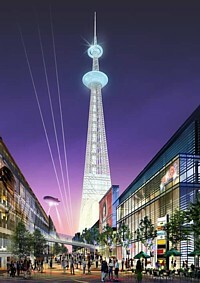 The year 2011 will also see the completion of the Sumida Tower, which will stand 614 meters (2001 feet) tall. As the tallest free-standing tower in the world and the tallest man-made structure in Japan, Sumida Tower will serve as a communications tower for six television stations. The tower, which is also referred to as the New Tokyo Tower, is expected to attract about 3 million people per year to Tokyo's Sumida ward, replacing Tokyo's other tower (Tokyo Tower) as the phallic tourist trap of choice. 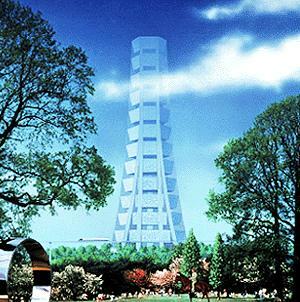 The Sumida Tower will dwarf the aging 333-meter Tokyo Tower, which was constructed in 1958 by the Takenaka Corporation. Since 1989, the Takenaka Corporation has been toying with the idea of constructing Sky City 1000, a 1 km (3281 feet) tall superstructure containing a virtual city of 35,000 residents and 100,000 workers. Sky City's 8 square kilometers (3.1 square miles) of floor space means there will be plenty of room for shops, schools, theaters, and all the other trappings of urban life that attract tourists. Sky City 1000 will no doubt be a nice place to explore, and it should relieve some of Tokyo's congestion and free up some green space in the city below -- which will be great for the peons living on the outside. For travelers seeking greater highs, there are space hotels. Since 1989, Shimizu Construction has been developing plans to construct a 64-room space hotel, which the company hopes to put into operation in another 20 to 30 years. At 450 kilometers (279 miles) above the planet surface, guests will enjoy fantastic views from their 7 x 4 meter rooms. 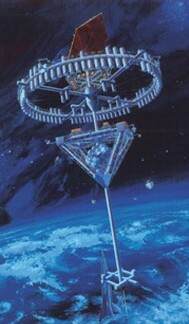 The 7,500 ton facility will rotate at 3 rpm, producing enough centrifugal force for an artificial gravity of 0.7 g.
For the traveler seeking a more colorful destination, there is Pon De Station, a 24-room low earth orbit hotel designed to resemble a stack of "Pon de Ring" donuts from Mister Donut. The Pon De Station design comes from the Space page on the quirky SNTV site, and it appears to be a variation of the proposed "Space Love" hotel that also appears on the site. The Space Love Project is seeking investors in its hotel, which will specialize in offering intimate space weddings. The hotel plans to offer rooms to couples for 10 million yen ($83,000), which includes the round-trip journey aboard a small space plane. For the ultimate getaway, there is Mars. Japanese construction giant Obayashi Corporation has been researching and developing plans for a Martian colony for over 10 years. According to the company's projections, the Martian population will reach 500 in the year 2057. 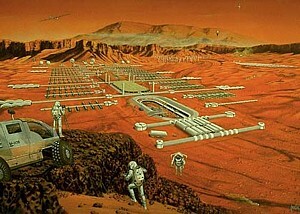 By 2090, the population will be 50,000 strong and the Martian economy will make up 5% of the solar system's GDP. By then, it should be an interesting tourist option. But the company believes Martians will declare independence from Earth in 2092, so you better hurry up and make those travel arrangements before things get sticky. Sky city 1000, space hotels and martian settlements all sound fine but lets see if they can build New Tokyo Tower within budget and on time. At least this, I can see in my lifetime. I am a writer of educational enrichment material for school students. I love your images! COuld I please have permission t use the image of Mars surface and the space hotel? I will give credit to you - of course. Please let me know if that would be OK and also how you want the credit worded. Once the Martins start wearing leather shorts,we are all in trouble! i will be one of thse sleeping behind the stars!!! what an imagination hotels in the space. amazing! Lol, this is fantastic, Mars is my favorite!